Kitchen Cow makes it to the Nuffnang Asia-Pacific Blog Awards Finals! Been busy most of the week so I couldn’t make share my wonderful news earlier. Kitchen Cow made it to the finals of the Nuffnang Asia-Pacific Blog Awards! Wheeeee! *is insanely happy* While making it to the finals has already made me extremely happy–I’ve been walking on air the past few days, dreaming about the old and new dishes I’ll get to eat when I get to Singapore–actually winning the Best Food Blog award would be even better. So, dear loyal readers, I’m asking, no, begging, for your help. Please vote for Kitchen Cow! And if you’re Filipino and want to vote for the other Pinoy finalists, they’re Wifely Steps for Parenting, En Route for Travel, Jehzlau-Concepts for Most Influential, Bryan Boy for Fashion, Jim Paredes for Celebrity and expats Octwelve for Best Blog Design and Mr Gadget for Geek Blog. Help us bring home the bacon Bah Kuh Teh! Vote, vote, vote! This entry was posted in admin, culinary events. Bookmark the permalink. 23 Responses to Kitchen Cow makes it to the Nuffnang Asia-Pacific Blog Awards Finals! congrats! we’ll sure be voting for you! Of course you can count on my vote! Go Team Cow! Thank you so so so much! Your support is very much appreciated. So excited about the whole thing. Wish me luck! Hi!!! wat a lovely way to get votes! hehe! hey it’s really good that u get a sponsored trip to Singapore! As for me, I’m already in SG. Yet, I’m still happy to get nominated in this grand award! I’m very excited about the Singapore trip part of it. I got to go there for the first time last year and it was an eye-opener. I spent most of my time there eating, hahahaha! I love your country’s food. Hainanese Chicken, especially, stole my heart. Looking forward to eating it again this October, heehee! Voted for you and still voting! Ha ha! I do the same, hehehe! Congrats! Hope you’ll win! Hope all Pinoy finalists will win! Nice one! Well support you all the way up! i love ur blog..so bright and fun..definitely will vote for the nuffnang awards! 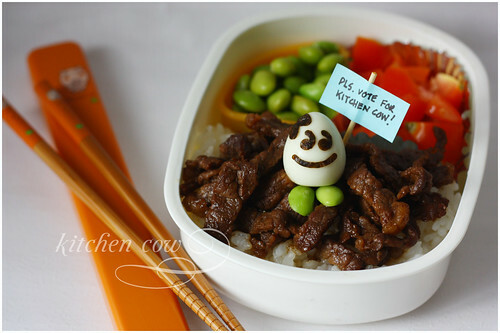 will visit again soon for bento recipes and ideas..good luck! just voted for Kitchen Cow!!! I’ll set my alarm every 2 hours. lol. I tried to vote but no confirmation messages popped. I’m using Firefox or Google Chrome, will try voting using IE.